Which major Cretaceous period dinosaurs were herbivores and carnivores? All of the remaining sauropods, such as Saltasaurus, Alamosaurus, and Argentinosaurus, were plant eaters. The most numerous and diverse herbivores in the Cretaceous, however, were the ornithischians, including the duck-billed ornithopods, the horned ceratopsians, the thick-headed pachycephalosaurs, and the armored ankylosaurs. The major carnivorous dinosaurs of the Cretaceous period were from the saurischian (lizard-hipped) groups, and were theropods. 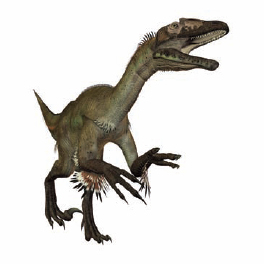 They included the large carnosaurs such as Giganotosaurus, Carcharodonotosaurus, and Tyrannosaurus, as well as the smaller, more agile dromaeosaurs, such as Velociraptor, Deinonychus, and Utahraptor. The list is huge, and more fossils of animals are found and added to the list each year. Raptors—dinosaurs with prominent claws used for hunting, such as the Utahraptor—were smaller than the Tyrannosaurus but made up for this by hunting in packs (Big Stock Photo).